The Manitoba Civil Service Learning Policy confirms this commitment and supports the overall renewal of the Manitoba civil service. Learning goals - What do I want to learn? Development activities – What will I do to reach my learning goals? Timeframe - When do I want to complete this learning? Measure of progress/success – How will I know when I have reached my learning goal? A comprehensive learning plan toolkit is available to all civil servants and their managers to assist in developing learning plans. We believe employees should be able to build meaningful careers while enhancing the work of the public service. We offer a number of learning and development programs to help employees succeed in their career in the Manitoba government. These programs support the goals of Provincial Civil Service Diversity Strategy. Offered in partnership with the University of Manitoba, the CPSM provides participants the opportunity to cultivate and enhance their management skills. The CPSM focuses specifically on public policy and current trends and issues facing the civil service. This program provides the opportunity for participants to transfer credits to the University of Manitoba. The EOS assists front-line supervisors in developing the critical skills and knowledge necessary to manage employees in today’s work environment. This program provides the opportunity for participants to transfer credits to post-secondary institutions within Manitoba. The CPSOA provides administrative support staff with the tools necessary to develop their self-management, communication and problem solving skills with a focus on working within a government environment. This program provides the opportunity for participants to transfer credits to post-secondary institutions within Manitoba. Leadership development initiatives internal to government help to ensure that all leaders, from front line managers to executive leaders, have the skills and knowledge to contribute to strong teams and support government’s ongoing commitment to good public service. In addition to the development programs identified above we also offer a variety of scheduled workshops to help employees strengthen their skills in the areas of leadership and management, interpersonal communications, oral and written communications and personal development. These workshops are offered in Winnipeg and throughout the province. For additional information see Organization and Staff Development. 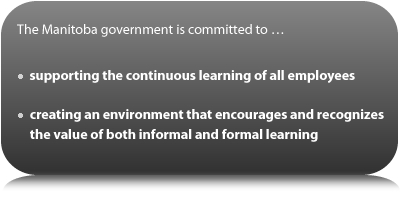 We provide ‘informal’ learning opportunities to help employees develop and strengthen critical skills for the future public service. About 80% of our skills are developed informally through other people and through self-directed learning. Informal learning can include coaching and mentoring, participation on committees, working on team projects and job rotation/shadowing. We also believe in the importance of building government-wide learning networks to further support employee development.